I've been waxing poetic about spring lately. (love those ramps!) This recipe has lots of great spring veggies, and is based on a salad recipe I found while trying to come up with some more creative ways to use my ramps. I added some pasta because I'm a sucker for a good pasta dish, but see tips and tricks below for more ideas. You've heard enough about spring veggies from me the last few weeks, so let's get right to the recipe! Combine dressing ingredients in small bowl. Whisk together and set aside. Bring a large pot of lightly salted water to boil. While water is heating up, prepare an ice bath. Boil defrosted peas in the water until bright green (about a minute). Transfer to ice bath with a strainer, then add your snap peas to your boiling water and cook for about 2 minutes until also bright green and slightly tender, then transfer these to your ice bath with the strainer. Finally, add your asparagus tips (not the stalks) to the water, and boil until just tender (another minute or so), before also transferring to your ice bath with the strainer. Now remove all the veggies from the ice water and transfer them to some towels to dry. Boil a separate pot of water to prepare your pasta according to package directions. Once the pasta is al dente, drain, and mix in the "dressing" ingredients. When your vegetables are relatively dry you can mix them in. Now for your asparagus puree. Transfer the stalks to the blanching water and boil them until they're very tender, just a couple of minutes. Transfer to a blender and add 2 tbsp of olive oil. Blend until smooth, adding a bit of blanching water if needed. Season with salt and pepper to taste then set aside to cool a bit. Finally, prepare your ramps. Heat some oil in a large skillet over medium-high heat. Add your ramps once hot and sauté until lightly browned in some areas and the leafy green part is beginning to soften. Season with salt and pepper to taste. Spoon asparagus puree onto bowls or plates. 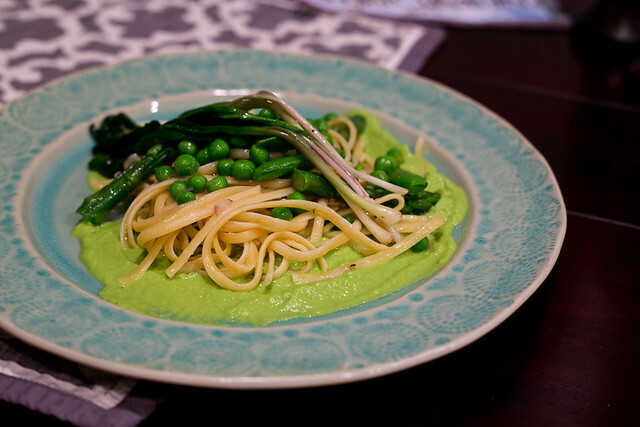 Place pasta with veggies on top, and finally top with ramps! Looking to cut down on the carbs? Want to make this gluten-free sans the gluten-free pasta? The original recipe I based this on was a salad, which is equally delicious. Substitute some micro greens or arugula for the pasta, and you're good to go!